It’s beginning to feel a lot like … Holiday Shopping! Many people wait until the last minute to get all their holiday shopping done, but not me! I like to start as early as possible, sometimes as early as August! The trick is to spread out the spending so it doesn’t seem like you’re really spending all that much. We at Vermont.com recently read an article(1), published last year, stating that Americans spend an average of $830 on Christmas gifts. I don’t think I typically spend that much, but it may end up being that high because I start so early. I am a transplant to Vermont and love to buy “Vermont-y” things for my family, so I decided to see how much I could get for that $830 on “Made in Vermont” products and items purchased from local Vermont stores. Keeping in mind that I typically buy for a few extended-family members as well, here is my shopping list (with total spent, before any taxes or shipping costs). My husband is an avid player of Dungeons & Dragons and is in need of one of the core rulebooks for the game ($50), so my first stop is the Northshire Bookstore in Manchester, VT. It’s a family-owned, independent bookstore that’s been in the area since 1976 and has been voted as one of the best independent bookstores in New England by Yankee Magazine(2). I absolutely love the atmosphere every time I visit. They have 3 floors full of books and gifts, with the top floor completely dedicated to children. And speaking of children – while I’m there, I’ll pick-up some LEGO toys ($30) for my 7-year-old nephew in Virginia, and a Melissa & Doug toy ($30) for my 4-year-old nephew in New Hampshire. Total Spent at the Northshire Bookstore: $110. My next stop is Mother Myrick’s Confectionery for some of the best local treats I can think of – their Lemon Lulu & Buttercrunch. I can get a combo of the two for my Dad and his family in Michigan for around $47, and I’m sure they will love it just as much as I do. 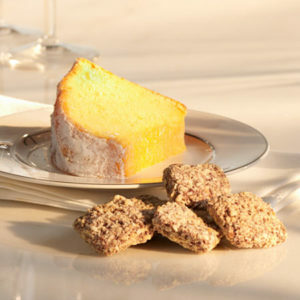 Some other items they offer include caramels, truffles, cookies, fudge, pies, and a whole lot more! Their retail shop is a great place to visit while you’re in Manchester – imagine the aroma of just-baked pies, and the sparkle of cellophane on gorgeous gift baskets. Total Spent at Mother Myrick’s: $47. Next, I’ll head down Depot Street and stop at Manchester Woodcraft, where you’ll find an incredible array of wooden gifts, toys, and household items. As you walk in the door you are greeted by the smell of fresh-cut wood and the sound of machines buzzing in the wood shop. 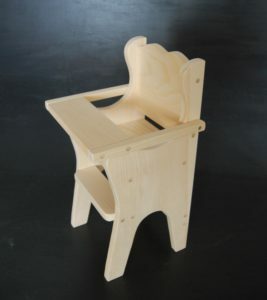 This year, I’ve decided to get a wooden doll highchair ($42) for my 2½ year old daughter. It will be a great project for us to paint together! Other items available include cutting boards, crafting supplies, desks & shelves, signs, frames, and more! Just across the street from the woodshop is Above All Vermont. It’s a great store to visit with a wonderful atmosphere. 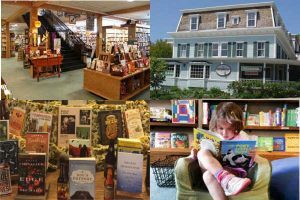 Much larger than it appears, this place is all about the nostalgia, whimsy and the quality that showcases many of the small, cottage based businesses in Vermont and New England. Here, I’ll pickup a few things for my mom and my aunt in Virginia. My mother hates the cold, so I’ll get her a microwave heating pad in a fun moose-shape ($35.50) to help her “maturing” bones stay warm during the winter. For my aunt, I’ll pickup a gift box ($22) with buttermilk pancake mix and pure Vermont Maple Syrup (her favorite!) from Brown Family Farm in Guilford, VT.
Total Spent at Above All Vermont: $57.50. Heading out of Manchester on Route 11/30, I’ll stop at Dutton Berry Farm. I’ve wanted to get a real Christmas tree for many years, I just haven’t been willing to clean-up after it, but I’ve decided that this year I’m going to get one! 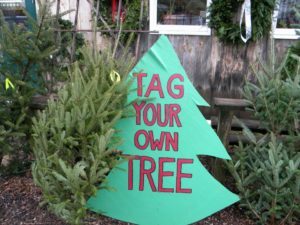 At Dutton, you can tag your own tree and cut it down (about $60 I believe, depending on the size). I’ve never cut a tree before – growing up in a city, my family would just go to the local tree lot to pick one that had already been cut, so this will be an adventure! They also sell wreaths and other holiday decorations, as well as yummy farm goodies like maple syrup, baked goods, fudge, and more! Total Spent at Dutton Berry Farm: $60. After dropping-off the tree and other goodies at home, I’ll head up Route 100 toward Weston to one of my favorite spots for holiday shopping, the Vermont Country Store. Located across from the Village Green in Weston, the store invites you to step back in time and enjoy a leisurely stroll down Memory Lane. They offer men’s & women’s clothing, kitchen & home supplies, personal care & beauty products, food & candy, games, toys, pet products, and more! I have two cousins in Virginia that long for the cold wintery weather of the north. 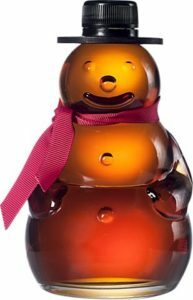 For them, I’ll pickup some Pure Vermont Maple Syrup in a cute 12.5oz snowman bottle ($25ea). For my brother-in-law and his husband, I’ll get some Anthon Berg Chocolate Liqueurs ($23ea) since they always seem to appreciate good chocolate just like I do. For my sister-in-law, I’ll get a hand etched “Tree of Life” necklace ($25) and for her husband, a Jerky & Beef Stick Gift Set ($40), with six mouthwatering varieties of jerky and sausage. Total Spent at Vermont Country Store: $161. 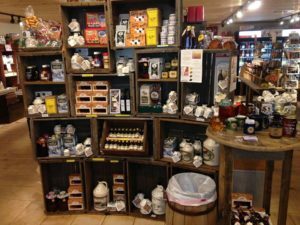 Another of my favorite “go-to” spots for holiday shopping is Maple Sugar & Vermont Spice, located in Mendon, VT. They often have a kiosk setup during the holidays at the Diamond Run Mall in Rutland, and I always make sure to stop for a few things, especially for my mother’s roommate since he loves food and loves to cook. On this trip, I’ve ordered a gift basket called “A Little Taste of Vermont” ($38). 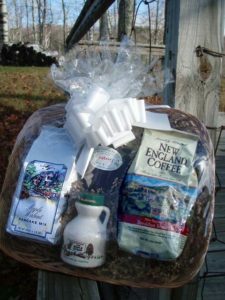 It comes with ½ pint pure Vermont maple syrup, Gormly’s Pancake Mix (from New Haven, VT), a 12oz package of New England Coffee, and a 13oz jar of Maple Country Kitchen’s homemade Jam or Jelly from Wells, VT. It’s a gift I know he’s sure to love! Total Spent at Maple Sugar & Vermont Spice: $38. After a long day of holiday shopping, I still have some money to spend, so I head home and get online to see what else I can find. 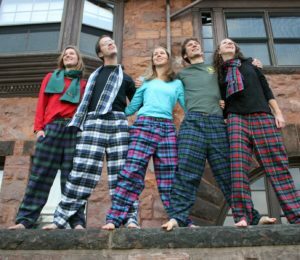 For my younger brother & his wife from Wisconsin, I found some great flannel lounge pants ($39ea) from The Vermont Flannel Company. They sell a ton of great items, including flannel blankets, shirts, leggings, sleepwear, hats, scarves, dog jackets, tote bags, dorm sheets, and more! I’m going to have to check them out again for sure. Total Spent at Vermont Flannel Company: $78. Last, but certainly not least, on my holiday shopping list, is my husband’s parents. They’ve been going thru a lot lately and work really hard. I figure, what better gift for them than some professional pampering. So I bought them a 50min “Couples Side-by-Side Massage” at the Stoweflake Mountain Resort & Spa. Stoweflake’s highly acclaimed, world-class spa is a destination unto itself with expansive facilities and a menu of wellness programs, natural non-invasive treatments, and salon services unrivaled in the northeast. It’s a gift I’m sure they’ll remember for a long time. Total Spent at Stoweflake: $260. So, how much did I end-up spending? … let’s find out! Not too bad, if I do say so myself. I did go over the initial $830 budget, but that’s technically just an “average” and I did include almost EVERYBODY on my holiday shopping list. If I had any money leftover after this shopping extravaganza, I would look for some good quality cards to send to the rest of my family & friends, and believe it or not, there’s a Vermont producer of such cards: Vermont Holiday Cards. The cards include Vermont & New England themes & settings, and all images are illustrated by Vermont Artist, Mike Biegel. I hope this list helps you find the perfect “Vermont-y” gifts for your family & friends, and that you enjoy your holiday shopping in Vermont! This entry was posted in Activities, Now Trending, Reviews, Shop, Things To Do, Uncategorized on November 6, 2016 by Renee-Marie Smith. Renee works at Vermont.com as an administrative assistant and graphic designer.